This recipe is a great example of how a vegan or gluten-free diet doesn’t mean a restrictive one. 1.Combine water, lemongrass, kaffir lime leaves, 1 teaspoon salt and 1 tbsp. coconut oil in a pot and bring to a boil. 2.Add quinoa, reduce heat to low, cover, and simmer for 15 minutes. 3.Leave lid on for another 5 minutes. 4.Fluff cooked quinoa with a fork. Discard lemongrass and kaffir. 5.Set pineapple slices on a grill set to 220C/430F. Char for 3 minutes on each side. Chop into bit-size chunks. 6.Whisk red curry paste, lime juice, 1 tbsp. coconut oil, olive oil, and 1/2 teaspoon salt in a bowl. 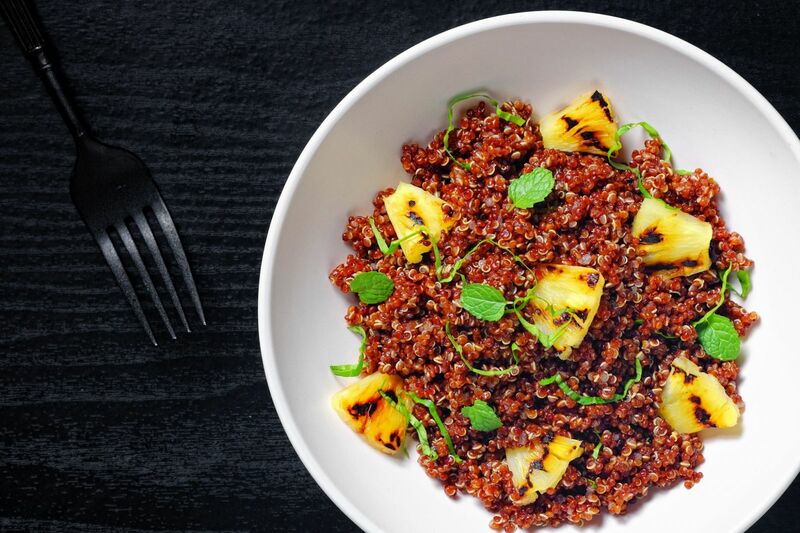 7.Toss cooked quinoa, pineapples, dressing, basil, and cilantro in a bowl.